The multi-billion dollar Ciputra International City complex, in northwest Hanoi, covers 300 hectares (741 acres) of former farmland with mansions, private schools, a clubhouse and fine wine store. Surrounded by thick concrete walls and guarded gates, it is a private enclave of ostentatious wealth – a paradise for the Vietnamese capital’s expatriate and local elite. Inside the gates, wide roads are flanked by luxury cars, palm trees and giant statues of Greek gods. Across the city, work is under way at Ecopark, a grand, $8bn (£5bn) private development being built on the eastern edge of Hanoi. Set to be completed in 2020, it promises secluded luxury with a private university, purpose-built “old town” and 18-hole golf course among the amenities planned. The first phase of the development, named Palm Springs – after the California desert resort city famous for hot springs, golf courses and five-star hotels – has just been completed. Gated communities and vast, privately built and managed “new towns” like these have spread across southeast Asia over the last 20 years as rising levels of inequality have redefined the region’s cities. Vietnam as a whole has seen a dramatic reduction in poverty over the same period – but inequality is growing, and becoming increasingly marked in the country’s expanding urban areas. “Before, most people were poor. Now it’s different,” says Lam, 40, who grew up on what was then the western fringe of Hanoi in the middle of fields of rice and cherry blossoms, kumquat and peach trees. Today he has a small business selling custom-made picture frames out of a shop-front carved from his house. The fields are long gone, and across the road a thick, high concrete wall separates Lam’s side (an unruly mix of motorbikes, plastic chairs set outside small tea shops, and dangling electrical wires) from the Ciputra complex, gated and guarded by 24-hour private security. “This side is just ordinary people. Over there, they are rich,” says Mien, 59, who like Lam runs a small business out of her home selling tea, cigarettes and bottles of water and soda. A handful of small plastic stools are scattered on the pavement in front of her one-room house. Between customers she lounges on her bed, a wire frame with no mattress. “Over here we have just enough to live on,” she says. Across Vietnam, the percentage of people living in extreme poverty has fallen from nearly 60% to just over 20% in the past 20 years. In 2010, the World Bank reclassified it as a “middle-income” country. But as Vietnam has liberalised its economy, so the number of extremely wealthy citizens has skyrocketed. By one estimate, the number of super-rich – those with assets of more than $30m – more than tripled in the last 10 years. And while the wealth gap may be largest between the rural poor and the urban elite, it is most noticeable in the cities where rich and poor live side by side. Bicycles compete with Mercedes and Range Rovers, and walls are going up, dividing high-end property developments from the villages, farms and small one-room houses, doubling up as tea shops and mechanics’ workshops. 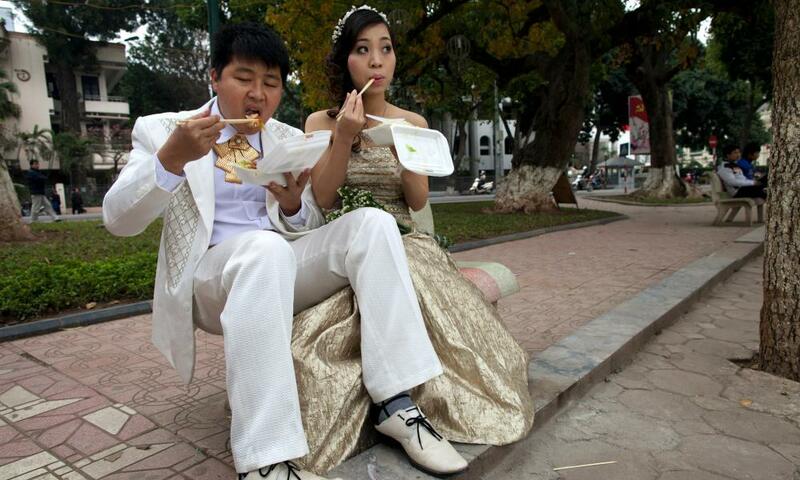 “Concerns about inequality will grow as more Vietnamese move to cities and are exposed to the differences between rich and poor,” warned Gabriel Demombynes, a senior World Bank economist, in 2014. 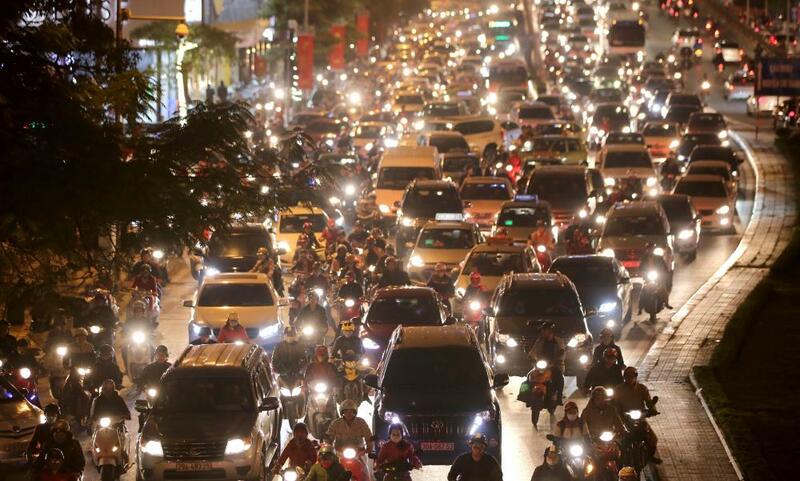 Already eight in 10 urban residents said that they worry about disparities in living standards in Vietnam, according to a survey on perceptions of inequality carried out by the bank and the Vietnamese Institute of Labour Science and Social Affairs. Hanoi is an ancient city. In 2010, it celebrated its 1,000th birthday. But now there are plans to gentrify the historic Old Quarter – where the streets still bear the names of the trades that clustered there: Hang Bac (silver), Hang Gai (silk), Hang Bo (baskets), and so on – by pushing thousands of people out of the area by 2020. In the suburbs, luxury high-rises are going up and enormous master-planned developments are taking over farms and rice fields. Across the city, former collective housing blocks are being demolished and replaced by private apartment complexes. In the city centre, well-heeled 20-somethings show off their shiny, vintage Vespas while sipping thick Vietnamese coffee at fashionable cafes. Lisa Drummond, an urban studies professor at York University in Toronto, has been studying Hanoi for decades. She says a “chasm has begun to open up” between rich and poor in the city, and that developments such as Ciputra and Ecopark reflect – and also perpetuate – these inequalities. Beyond Ciputra’s walls, villas painted shades of beige are set amid lush private gardens – with price-tags of as much as £3,000 a month to rent (25 times the minimum wage). A world unto itself, the complex is a land of Greek revival architecture, tennis courts and amenities including a beauty salon and a post office. The United Nations International School moved there in 2004, followed by two other private schools, and a private kindergarten. Under construction still are a mega-shopping mall and a private hospital. Built in the early 2000s to house up to 50,000 people, Ciputra was Hanoi’s first “integrated new town development”, and the first overseas project of the Ciputra Group, an Indonesian conglomerate named after its billionaire founder that specialises in large-scale property developments and private townships. Designed so that residents rarely need to leave – or interact with the world around them – the company says the Hanoi complex offers “the very best of living, business, shopping, leisure and entertainment in one premier location”. Today it is one of a growing number of gated communities and large-scale private townships in and around the city. Danielle Labbé, professor of urban planning at the University of Montreal, has been following the explosion of master-planned “new urban areas” in Hanoi for years. She estimates there are about 35 of these projects already completed in Hanoi, with as many as 200 more at different stages in the pipeline. Not all of these developments – where housing, infrastructure and other services are built at the same time – are physically gated, and most are not as large as Ciputra or Ecopark, says Labbé. But the projects all share a principal target market: the wealthiest residents in the city. “The reality is that these projects, the housing and the living environments that are produced, are basically out of reach to the majority of the population,” Labbé says, despite there being “an enormous demand for urban housing in Vietnam which is not being met”. Real-estate developers and investors around the world have ploughed billions into gated communities and increasingly ambitious master-planned developments. In western India, Lavasa is an audacious $30bn project to build the country’s first entirely private city. From Punta del Este in Uruguay to Bangkok, Thailand, elite enclaves are being carved out of cities on every continent. But while security concerns and a fear of urban crime are typically among the motives driving the elite behind walls in cities in South America and sub-Saharan Africa, in Hanoi developments are increasingly being marketed as exclusive enclaves of convenience and clean air, away from the air pollution and traffic congestion of the city. On Hanoi’s worst days, thick smog blankets the city. Street hawkers across the city sell multi-coloured, fabric surgical-style masks, now ubiquitous on its congested roads. Millions of motorbikes and a growing number of cars kick up dust and spew smoke into the air, honking horns and revving engines. Crossing the street can be a dangerous move, particularly for children and the elderly, and fear is spreading about the health impact of the city’s increasingly polluted air. On a late weekday morning, traffic is in full swing outside Ciputra’s gates. 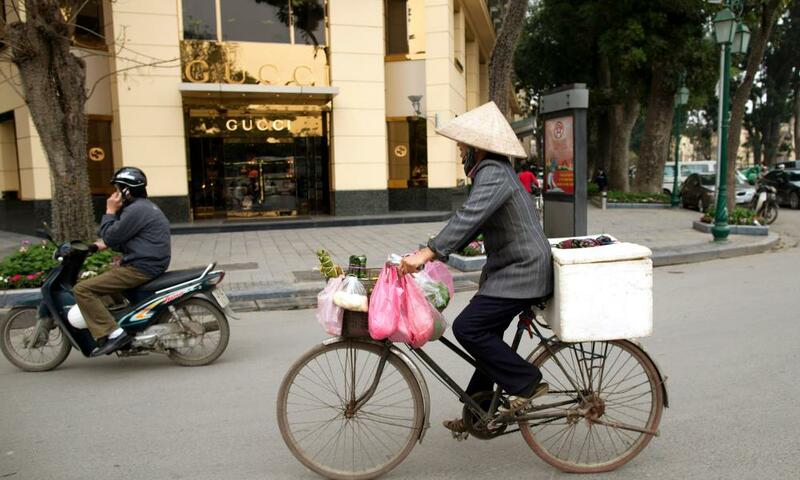 But inside the development – marketed as a “peaceful oasis among the hustle and bustle of Hanoi” – it is calm and quiet. Street hawkers are not allowed inside, and the only sound of life is that of children playing in the yard of one of the complex’s elite private schools. Across the city, on the eastern edge of Hanoi, Ecopark similarly advertises a “perfect harmony of humans and nature”, boasting of “various open areas where you and your family can go for a walk or simply sit under the shade of a tree for a picnic, and enjoy nature at its best”. Developed by Viet Hung Urban Development and Investment, a joint venture of several Vietnamese property companies, Ecopark is a mammoth 500-hectare master-planned development. Set to be fully developed in 2020, Ecopark is opening in phases, with its first community – Palm Springs – already complete and home to 1,500 apartments, 500 villas and 150 shophouses. Eventually, this new “township” will have a number of connected but separate areas including a “resort-style community” offering a “sanctuary of only the highest standards and services” with swimming pools, tennis courts and “chic outlet shopping”. The private British University Vietnam is also building a $70m campus for up to 7,000 full-time students. On a weekday afternoon, a recently opened neighbourhood in the development is quiet, with more guards patrolling the streets than pedestrians. Beyond the swimming pool and landscaped greens, a shop – without any customers – has a floor lamp in the window on sale for £1,200, or more than 10 times the minimum monthly salary for a worker in Vietnam. 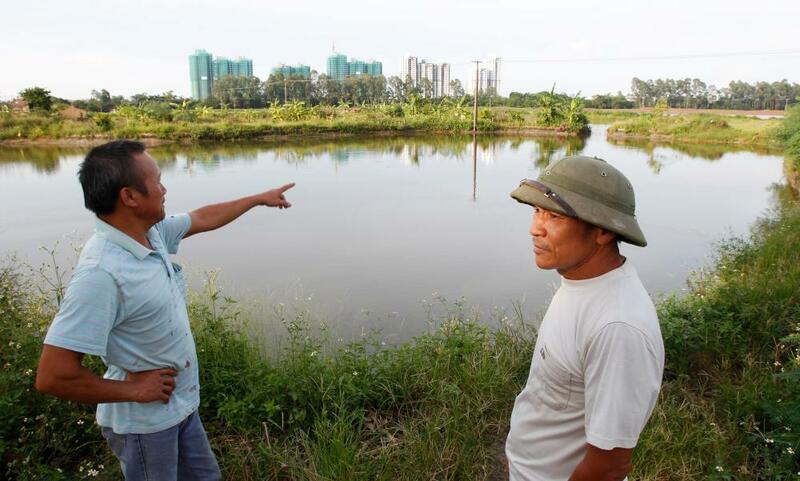 But for most Vietnamese people, living in Ecopark is far out of reach, and the project’s development has been marred by repeated protests from local communities who have lost their rice fields and farmland to its expansion. In 2006, construction was temporarily suspended amid protests by local communities who were losing their land to the project. Protests erupted again in 2009 and 2012. In April 2012, police descended on local villagers armed with stones and molotov cocktails, firing teargas into the crowds, in one of the country’s most violent land disputes in recent memory. Several protesters were arrested and journalists documenting the evictions were reportedly beaten by the police. 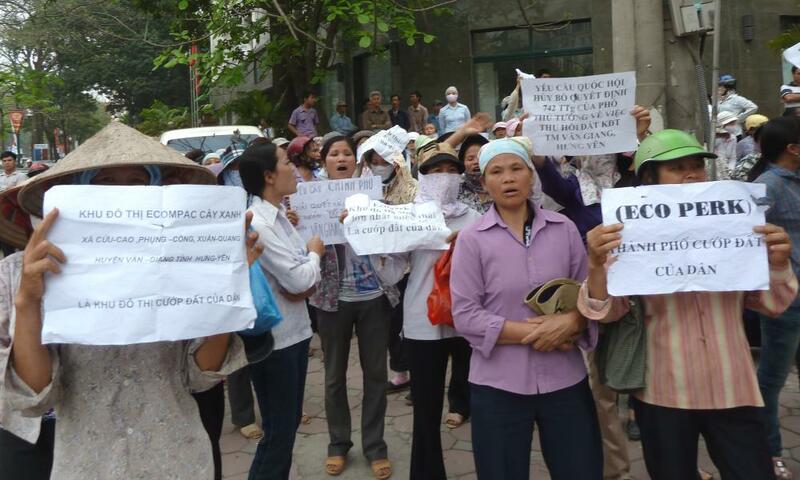 Across Vietnam, communities have protested against low levels of compensation given for land that has been taken for large-scale industrial and real-estate developments. “There have been protests, everywhere in the country, in the last few years,” Labbé says. In the area near the Ecopark development, villagers say thousands of families were forced against their will to give up their land, with many former farmers now unemployed and in debt as a result of losing their livelihood. Phu is one of them. The octogenarian former rice farmer lives in Xuan Quang village, a short drive from Ecopark. He says his family lost almost 1,000 sq m of land to the project, for which they received 50m dong (around £1,500). He says this was not enough to compensate for his family’s loss, and that he and his children, who were also farmers, are now without work. Ciputra and Ecopark did not respond to questions about their developments and how they impact local communities and the wider city. There is a lot of money to be made in Hanoi’s gated communities, private townships and luxury property developments, and catering to the urban elite has made some of Vietnam’s wealthy even wealthier. When Forbes Vietnam launched in 2014, one of its earliest issues profiled the country’s first billionaire, Pham Nhat Vuong – sometimes described as “the Vietnamese Donald Trump”. His estimated $1.9bn net worth draws on his majority stake in Vingroup, one of the country’s largest developers of shopping malls and high-end housing developments. In Hanoi, Vingroup’s portfolio includes a massive underground complex south of the city centre, complete with a year-round ice skating rink. And it’s not just the capital that’s being transformed. Across the country construction is under way. Singaporean property giants Keppel Land and Banyan Tree Holdings are major investors, along with the South Korean firm Lotte and Hong Kong’s Sun Wah Group. With Vung Ro Petroleum, a Vietnamese company, the US-based Rose Rock Group, an investment firm founded by members of the Rockefeller family, is developing a massive $2.5bn real estate complex along the south-eastern coast. Related: Punta del Este: is Uruguay’s elitest ‘gated city’ a glimpse of all our urban futures? Labbé says this development boom was spurred on by two key pieces of legislation: a new land law in 2003, and a decree in 2007 that transferred power to redevelop land to local authorities (previously, decisions had to be taken by the prime minister). Last year, Vietnam also loosened its long-standing restrictions on foreign ownership of companies and property in the country – adopting new policies to boost overseas investment in real estate that could further fuel these trends. Back on the border with Ciputra, Lam says he occasionally gets business from people who live in the gated community. On his desk, propped up against the wall, are three bright paintings, elegantly framed in simple dark wood, for clients in Ciputra. But he says such commissions are rare, with little of the wealth from inside the complex trickling down.